Ran out of Steam – and a New Challenge! Well – Self Stitched September sort of petered out, didn’t it? The temperatures stayed in the upper nineties until the bitter end of the month, and I just ran out of self made clothing to post about. I have oodles of winter clothes that are hand made, as well as scarves, gloves and sweaters – just not that many summer things any more. So what now? It’s October now, which means time to start thinking about Christmas presents for family and friends. As per our family’s norm, I like to keep presents simple, meaningful, and as home made as possible – with natural materials, recycled and reclaimed if possible. Sounds ratty, doesn’t it? It’s not! To keep myself motivated – and to have fabulous ideas at my disposable – I’ve teamed up with Melissa at Until Wednesday Calls and with the fabulous Ms. C. at The Sewing Dork for another Sew/Craft Along. 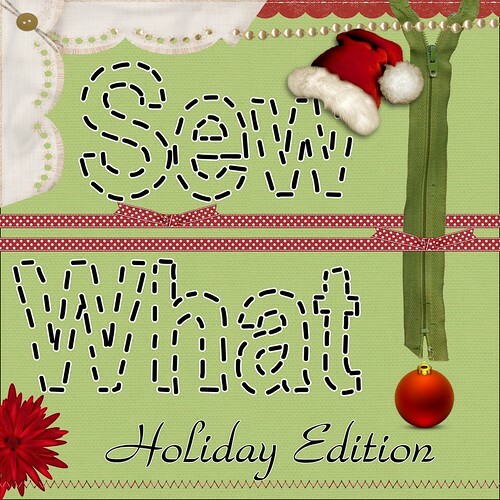 It’s the Sew What Holiday Edition! At the beginning of each week Melissa and C post a challenge for themselves, and they invite Blog World to craft along with them. Here are the Categories for the Sew What Holiday Edition. Week Three: A stocking or toy or both! If you’d like to play along, visit The Sewing Dork or Until Wednesday Calls for the details. Previous Post Derailleurs are for WIMPS!